Valentines day has come and gone now. What can be more lovely than a wedding on this special day. 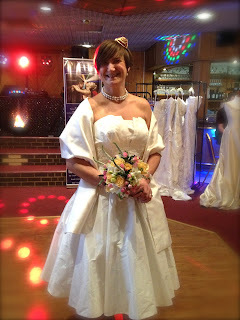 Congratulations to Samantha and Jon on their special day yesterday. Here are some of the lovely flowers from the day. The colour choice was purple, cream and lilac. 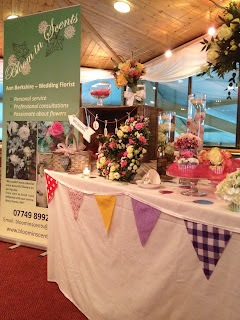 The venue was at Dodford Manor. The little bridesmaid Belle was holding a basket of petals. 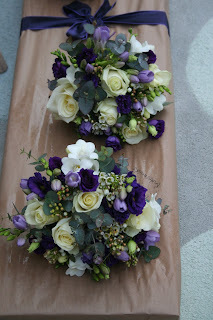 The tables centrepieces were fishbowls with hydrangea heads and either steel grass or dendrobuim orchids. The ceremony table/room had a large double ended spray with candles and two floor standing candles in large vases. This would of looked stunning when it was lit. Wish the new bride and groom and their lovely family all the best for the future. Well what a wonderful day. Everything to do with weddings under one roof. 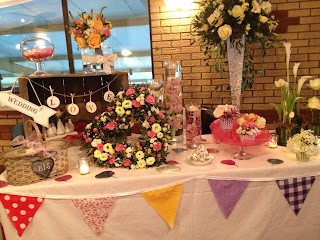 It was lovely to meet new brides and to chat all things floral with the people I met. I was particularly proud of my exhibit. And it seems to have generated some new interest! The model in the photo is holding my bouquet. Here is a more close up shot of the flowers. I also had a large table arrangement. The vase is filled with clear gel and this arrangement has lots of gorgeous flowers including the avalanche rose, freesia, veronica, eustoma, erynguim and carnations. I also had these sweet little cup cakes that sell from £8 to £12 each depending on what goes in it. They are adorable! 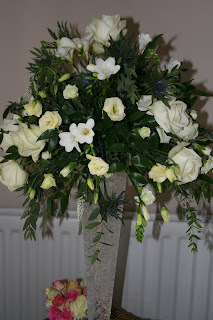 I am also running the LIKE MY FACE BOOK page to win a flower arrangement. The winner will be selected at the end of Feb. Good luck guys! Well the day is nearly upon us and preparations are under way. Very excited to pick up my banner and new business cards today. 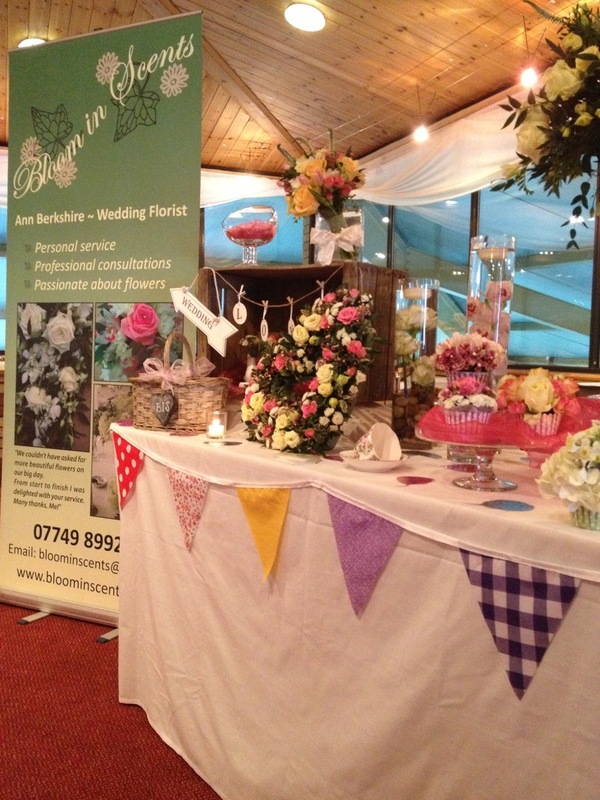 Looking forward to meeting many new brides on sunday. Hope to see you there and will post pictures from the event next week.